I love eggplant. You may already be familiar with my visitor-approved aromatic ragout recipe — if you’re not, I recommend making it ASAP before the eggplant season ends. I also love foods and dishes that combine sweet and salty tastes (think peanut butter and chocolate, salted butter on warm, sweet pancakes…). This summer, my boyfriend made delicious sweet-and-salty eggplant rounds for us, using honey and salt. Later I recreated the recipe but used soy sauce instead of salt, which lent a deeper, richer flavor. Cooking eggplant rounds on the stovetop produces hearty slices that are great for sandwiches and alone. This method takes quite a bit of patience, however — patience that I don’t always have in the kitchen. So today I diced the eggplant instead and threw it into the pan where I’d already started sautéing some onions and garlic. 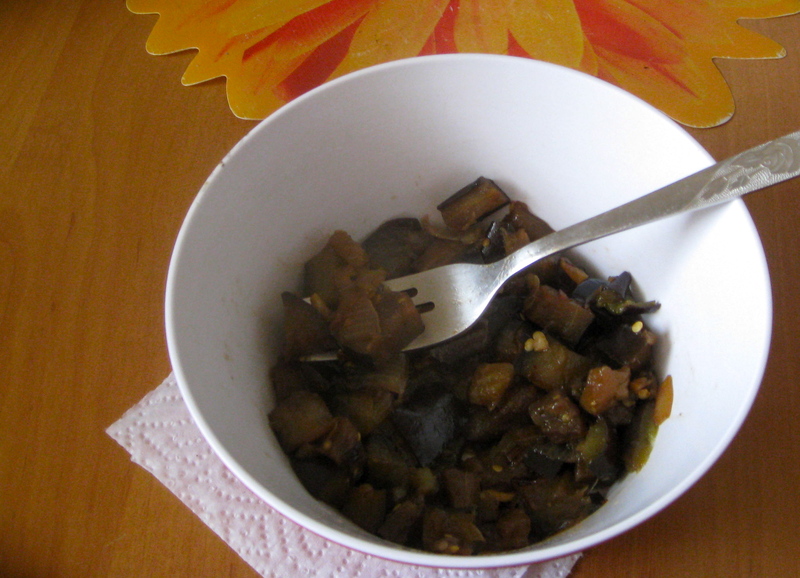 The result was creamy, richly flavored soy-honey eggplant. Here are two ways to create sweet-salty eggplant. Cut the eggplants into thick-ish slices (the thicker they are the longer they’ll take to cook but the better they’ll hold together). Put rounds — as many as will fit — into an oiled pan on medium-low heat. Sprinkle eggplants with a generous amount of salt and put a dab of honey on top of each slice. Cook the rounds on one side until the begin to visibly soften and the flesh starts to turn translucent. Flip the rounds at this point, and add a bit more salt and honey, if desired. The trick here is to let the honey caramelize the eggplant — play around with the stove’s heat to achieve this effect. When the slices are cooked to your preferred softness, take them off the heat and throw the next batch on! Start sautéing the onion and garlic in olive oil over medium heat. Season with salt, pepper, and red pepper flakes to your taste (go easy on the salt because the soy sauce will add a lot more later). Meanwhile, dice the eggplant and add it to the onion and garlic. Once all the eggplant is added to the pan, add the honey and soy sauce and stir. Turn the heat to medium-low and cook, covered, stirring occasionally, until the eggplant is cooked to your preferred softness. This entry was posted in food, health, pictures, recipes on 16.10.2012 by taplatt.